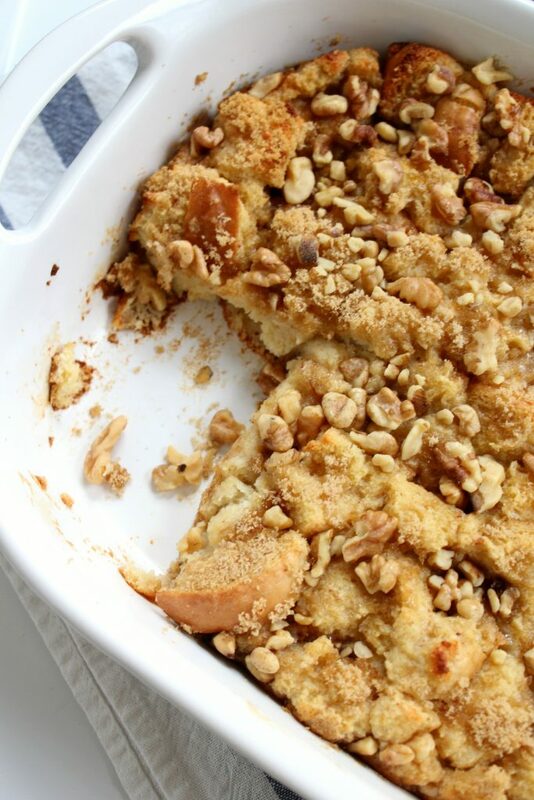 Whether it’s Christmas morning breakfast or you are just in need of a delicious treat, you will love this Brown Sugar and Maple Bread Pudding. Spray a 9x13 baking dish with non-stick cooking spray and set aside. Place cubed bread in large bowl and set aside. In separate smaller bowl, whisk eggs, cinnamon, syrup, sugar, milk, vanilla, and salt. Pour egg mixture over bread and gently toss until all bread is coated. Pour bread into 9x13 pan and spread evenly in pan. Let bread sit for 5-10 minutes or until egg mixture has soaked through. Sprinkle brown sugar and walnuts on top of bread. Bake 40-45 minutes or until golden brown on top. Remove from oven and let cool for at least 10 minutes for easier serving.